What are WWI Medals worth? Two kinds of World War I medals exist: medals for campaigns, and medals for distinguished service or gallantry. Campaign medals were awarded for military service in areas outside the United Kingdom. A limit of three medals per individual applied in most cases. Medals featured the recipient’s name and other details such as rank, military unit, and service number. Several types of campaign medals were given in World War I. The 1914 or 1914-1915 Star, called Pip, was one medal. 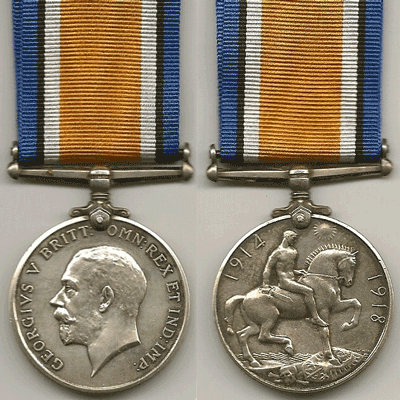 The British War Medal, or Squeak, was a second type. The Victory Medal, dubbed Wilfred, was the third medal. The names of Pip, Squeak, and Wilfred came from a comic strip in the Daily Mirror newspaper. No one is quite sure how those names became associated with comic strip characters, but the names have stuck. These three medals are the most common family heirlooms. About 378,000 of the 1914 Star Medals were given to those who assisted the French in resisting the German army from August to November 1914. The 1914-1915 Star was given to those in service between August 1914 and December 1915. Approximately 2.4 million of these medals were given along with the Victory Medal and the British War Medal. 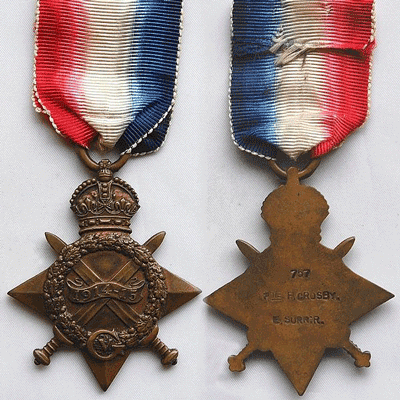 The British War Medal was awarded for those who served overseas between August 1914 and November 1918. Around 6.5 million of these medals were issued mostly in silver, with about 110,000 issued in bronze. The Victory Medal was issued to approximately 5.7 million service members. The Territorial Force Medal, Silver War Badge, and Mercantile Marine War Medal were other types of medals issued to select groups of service members. Service members who retired due to war wounds or who were honourably discharged were eligible to receive another badge. Gallantry medals were awarded for demonstrating unique courage, duty, and devotion during military action. The memorial plaque, or death plaque, was given to family members of British service personnel killed in the war. These plaques were crafted of bronze. Over 1.3 million memorial plaques were produced through the 1930s. If you would like a free, no obligation valuation of your WWI Medals please use the form below. You can also email details about your WWI Medals to [email protected] or call us on 01270 440357.